Each form can have only one button where the Default property is True and one . button with a Cancel property that’s True, but they can be the same button. You set the Cancel button’s Default property to True when confirming an action that’s often selected by mistake, and when not canceling results in an Irreversible action such as deleting a file. 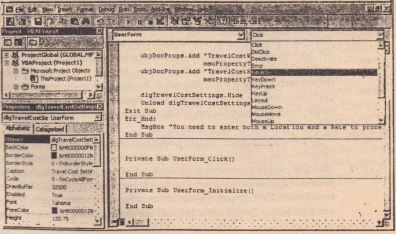 The procedures you wrote earlier by using the VB Editor or the Macro Recorder have been general procedures that can be run from a toolbar, menu bar, shortcut key, Macros calog box, or the VB IDE. El’ellt procedures are blocks of code attached to an object’s events that run in response to an event: a mouse click, a key press on the keyboard, or a emevent. “But what about my text boxes?” You really don’t care when a user types an entry in the text boxes; you just care what the text is when they click the cmd Save Settings button. 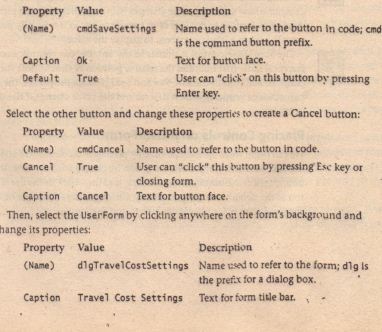 to apttoned Ok).If the user clicks the cmdCancel button (captioned Cancel), the contents of the text boxes won’t matter. But as soon as either command button is clicked, it’s time for action, so we’ll create code attached to events on these two command buttons. 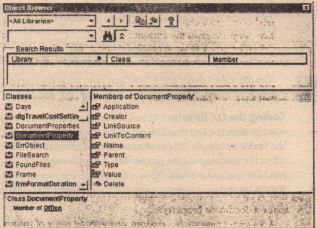 When a user clicks the cmd Save Settings button, you want to store the location of the Excel worksheet and the rate that the user entered in the Text Box controls. You need to-store this information in a way that we can recall it when the user reopens the project file. A simple variable w’ill not work because, regardless of scope, variables are removed from memory when you unload the application they’re created in. 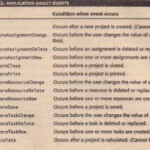 To keep a value from one Project 2000 session to another, you need to use a document property. Some basic error-handling has been added in these procedures, but”it is far from thorough. 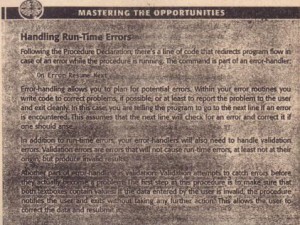 See the VBA Help file for more information on error-handling.